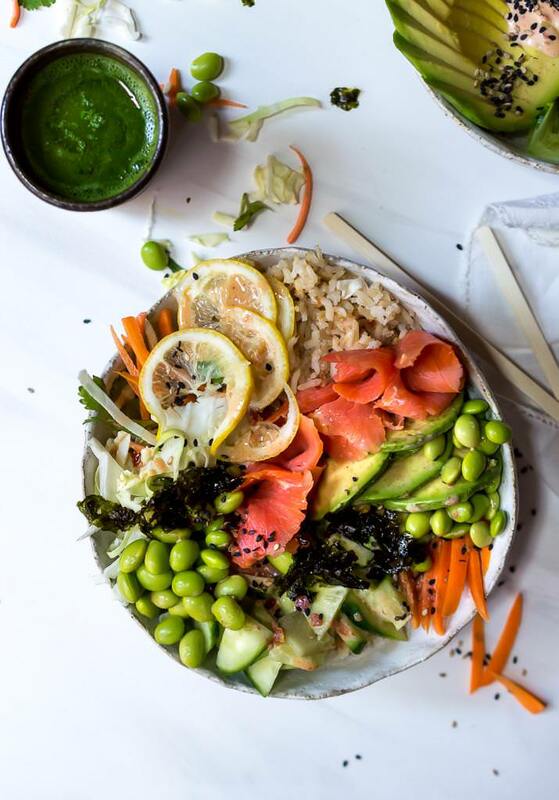 Enjoy fresh sushi at home with this Salmon Sushi Bowl Recipe! 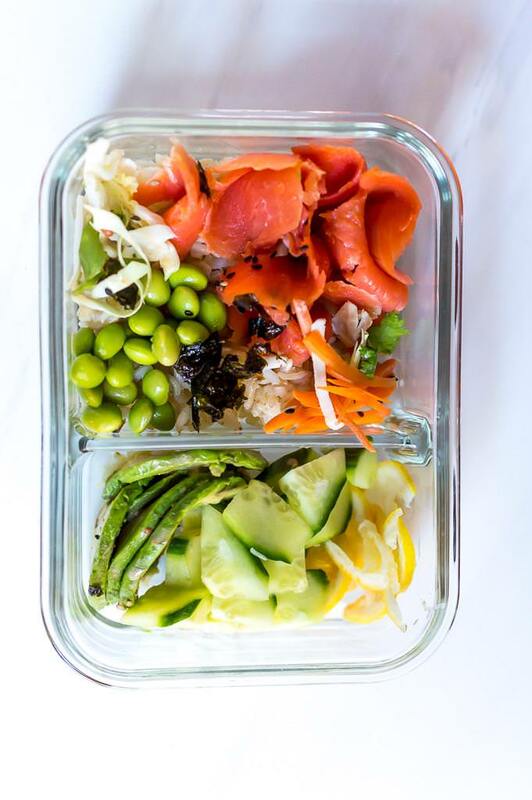 This no-fuss salmon roll bowl is made with smoked salmon, so anyone can do it. 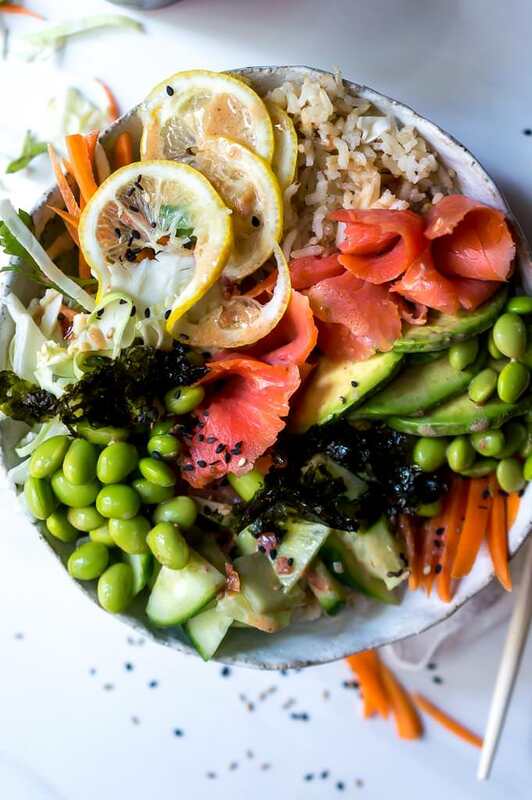 Fresh ingredients and ginger dressing make this sushi bowl extra flavorful. This recipe is dairy free, gluten free and has options for grain free, Whole 30 and Paleo diets. I just really don’t go to sushi restaurants anymore. The sushi in my area just isn’t the quality I am looking for. When I go visit a larger city I usually hit up a good restaurant. But, until then I take care of my sushi cravings at home with things like this Salmon Sushi Bowl, Spicy Crab Sushi Bowlor this California Roll Sushi Bowl. I don’t mess with trying to track down sushi grade salmon. Using smoked salmon lox is a bit of a cheat. You can find smoked salmon lox pretty much anywhere. Sushi grade salmon is much more difficult to find, especially if you don’t live in a large city. This recipe is adaptable if you are following a specific eating plan. Trade the rice for cauli rice and it is grain free. Trade out the rice for cauliflower rice and omit the soy beans to make this Paleo and Whole30 compliant. How can you make this recipe Grain Free, Paleo and Whole30 compliant? Easy, just use cauliflower rice instead or regular rice. Here is a great tutorial: How To Make Cauliflower Rice. I prefer to cook my cauli-rice at medium high to brown it though and do not cover with a lid. For Whole30 and Paleo, omit the soy beans as well. How do you prepare this for meal prep? Just plop all the ingredients into your containers and refrigerate. If possible, cut the avocado before serving to prevent browning and keep dressing in a separate container to prevent sogginess. What if you don’t like ginger? No problemo. 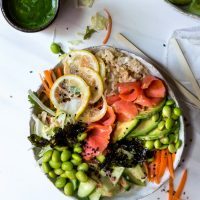 This salmon sushi bowl tastes great with the Spicy Dressing from my crab bowl. 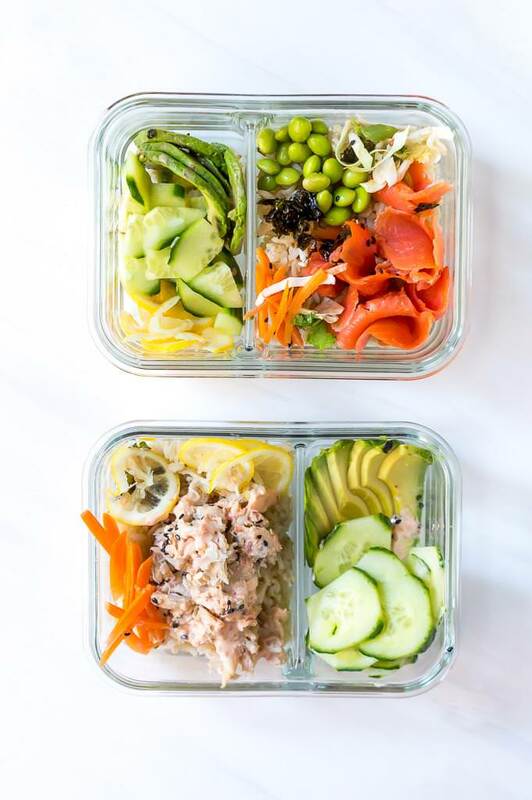 For meal prep, I use these Glass Meal Prep Containers with Lids . You will need a Sharp Knife, a Good Cutting Board and a Microplane for grating the ginger. Mix all dressing ingredients and drizzle over sushi bowls.